Product code: W688cc Categories: Omega Watches, Watches. The Omega Constellation is this watch that is fitted with the highest grade movements produced by Omega, and here is one of the rarest models of Omega Constellations, a very beautiful and rare vintage 18ct Omega constellation Grand Luxe reference 168.002. In superb condition, this Omega Constellation was made in 1966 and is all in solid 18ct yellow gold including the equally as rare original Omega Reinhor band. Not only is the case and band solid 18ct yellow gold, but the dial itself is also 18ct gold and the index markers made of black onyx. With the date window at 3 o'clock and centre sweep seconds, this is such a handsome and elegant watch to wear all the time and combined with the fabulous semi-extending Reinhor bracelet which stretches and extends, this is such a comfortable watch to wear. Measuring 34mm across plus the Omega Constellation crown, inside is the brilliant and highly accurate Chronometer rated 24 jewelled automatic Omega calibre 561 that runs perfect and comes with our twelve month warranty. If you have been after a rare and very collectable Omega Constellation, then you would be hard pressed to find a more rarer one than this. Tags: Omega, Omega Constellation, Omega watch. 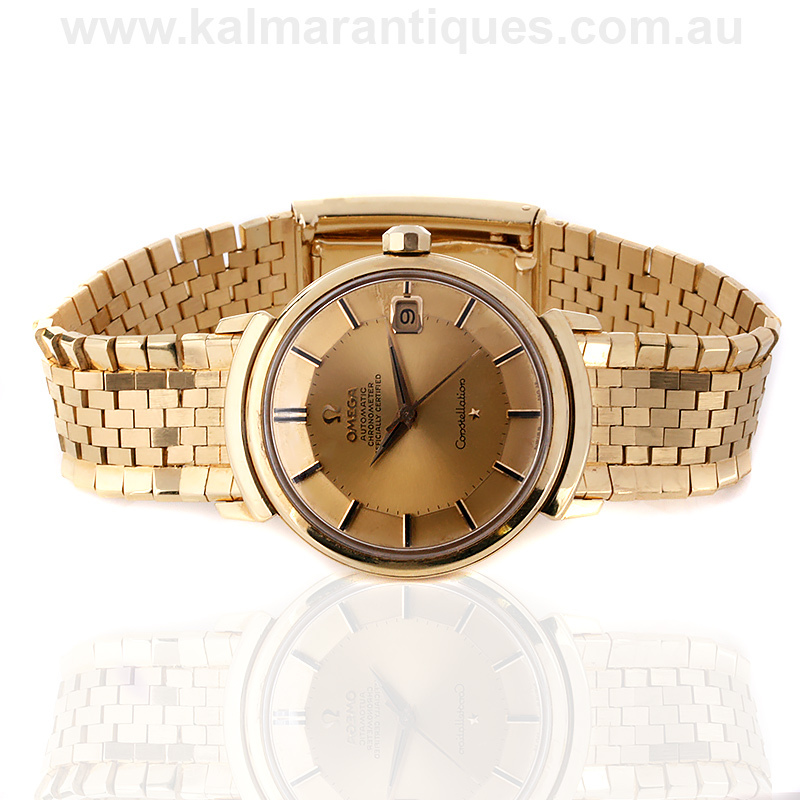 Vintage 18ct Omega constellation Grand Luxe reference 168.002.